I recently upgraded to piledriver, picked up the FX 6300. So far 4.5ghz is the best I can get mine stable, which I am pretty pleased with. Here are scores and screens of the benchmarks I've ran, for anyone who might like to compare. Cool man. What did you upgrade from? And was it worth it? I came from a PII X4 965 which did 4hghz, but ran for most of the time at 3.8ghz. Didn't necessarily need it, but had a little money to burn, and didn't need to go all out for my needs. BF3 seems to play a bit smoother than previously. Windows 8 also boots up and shuts down a bit quicker than with the 965. Plus it's been fun playing around with OC'ing it. I'm still tinkering with some multi/fsb combinations, maybe I can get some more out of it. Here are my results during a 3v3 replay with a big encounter with mothership cloaking a bunch of battlecruisers and other units killing each other (all 3 races represented in the 6 armies). I paid $119 to replace my old Phenom II with an FX-6300. I overclocked the phenom to 3.8 GHz, and overclocked its CPU-NB to 2.6 GHz. It was about maxed out. But just the stock default settings of the FX-6300 were able to pretty much match the heavily overclocked Phenom II. As I overclocked the FX-6300 it just walked away from the Phenom II. So I'd say if you play a CPU intensive game like Starcraft 2, and you already have a motherboard that has a Phenom II, then it's a deal to improve the performance. I mean you can see how my framerate was hovering around 45 with the phenom, but the FX-6300 was up in the 70s. I'm quite pleased. But my motherboard could just swap the chips (it's an Asus M4A89GTD PRO/USB3). Keep in mind my motherboard is *NOT* listed as supporting AM3+; it's listed as just an AM3 board. However, the FX chips work fine, after putting the most recent 3030 beta BIOS. I wonder if we throw a low end i5 into the mix if the results would be comparable. That is respectable for Piledriver and the FX6300 has very good performance for the $ especially if you overclock. ^ Thanks for that. 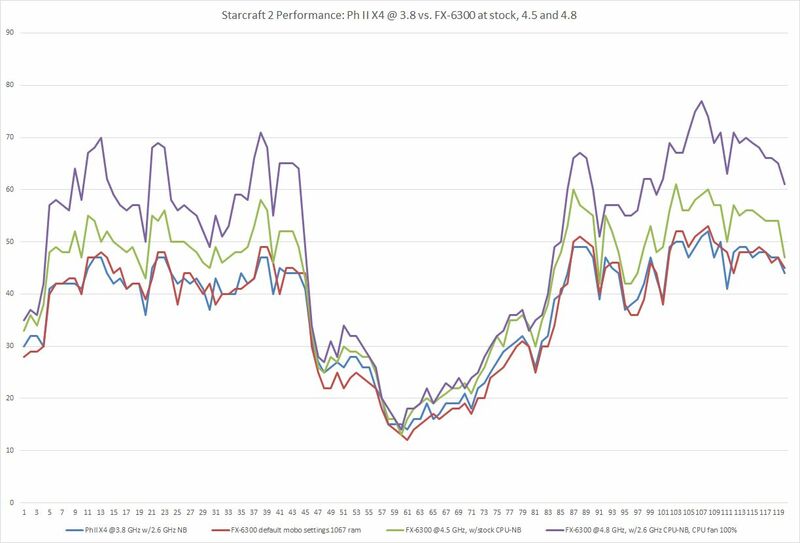 It's interesting to see that the reported large performance increases in SC2 from Phenom II NB overclocking carry through to Piledriver. Though it makes me wonder why AMD choose not release a higher stock NB frequency on at least some higher-end SKUs. In any case, I find this thread particularly interesting insofar as the 6300 has always struck me as an impressive value proposition for people desiring to build a solid mid-range system with better-than-intel multi-threaded performance and still very respectable gaming performance -- especially with its lower stock clock and unlocked multiplier, I would think that this chip would get more recommendations for OC-friendly builders on a budget. Yeah I'll be upgrading to a 6300 next month. Here's to hoping no new financial surprises for me. I was really hoping AMD would release a 4370. I read on couple of articles few days ago, Piledriver/Vishera might get an update. Just rumors even thought I would not be suprised since Steamroller is out in Q4 2013 or Q1 of 2014 most likely so there should be something betwen Piledriver Release and Steamroller Release. Nice overclocking scores. Enjoy it. Very cool OC. Good job getting people informed. Can you disable half the cores (so it is just 1 core per module) and run that same test? Or just set the affinity to cores 0, 2, 4. The FX line are nice CPUs. It's keeping Intel's best affordable for a change. I seriously doubt Intel would have raised prices if Piledriver had not come out, and Bulldozer was hardly competitive enough to keep prices down. In fact AMD had to lower their prices because they overpriced BD out of the gate. What I really wish is that PD would force intel to bring out a mainstream hex core and/or at least increase clockspeeds, since they have plenty of headroom to do so. Not going to happen, ever. They are priced exactly where Intel needs them to be, Intels intend is to milk 300$ for hyperthreaded quadcores up to 5nm. But at least offer the option of a hex-core, even if it does cost more money ($500-600?). Isn't the 3939k in that price range already? Problem is I believe it is on a different socket that is more expensive. I am sure they could make money on a 400.00 hex core. I agree about the pricing. Although I still think the 3570k is a fantastic bargain, the 3770 not so much. That is why I said I did not think their pricing was affected much by what amd puts out. What voltage do you use for 4.4ghz? Just play around see what your chip handles. One approach is to pick a voltage that is high to get good overclock, but enough where your cooling can keep temperatures reasonable. Then, begin to lower voltage until you become unstable. Then you found your voltage. Also, watch to make sure your motherboard doesn't throttle the chip. That might happen if your motherboard voltage regulators get too warm, and the motherboard tries to cool them off by forcing the CPU to slow down (even though the CPU is fine and not overheating, the motherboard is calling the shots). If that is happening, you could also add some cooling to make sure your motherboard heatsinks aren't getting too hot when delivering current for the overclock. This might be more of an issue if your CPU cooler is arranged to prevent a lot of cool air from reaching the motherboard etc.